Please note that there is currently a two week lead time on the dispatch of this product. The DAC20 is a software upgrade from the established CML Electronics DAC10 accessory decoder. If you wish to upgrade DAC10 to the DAC20 software, you can do so by purchasing the DAC20 Processor Upgrade instead. 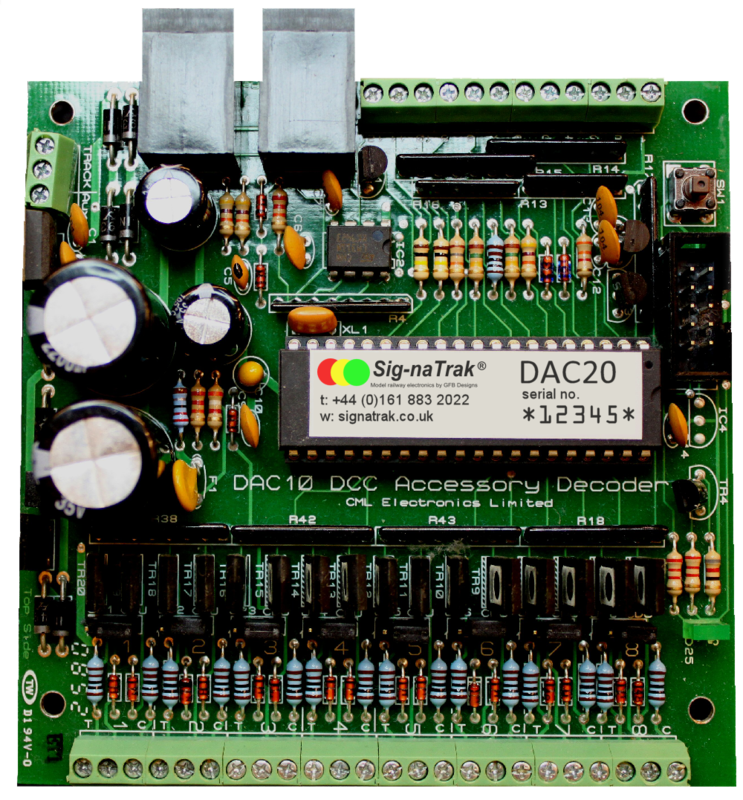 The DAC20 accessory decoder allows control of up to 8 solenoid or Tortoise type point motors on a DCC controlled model railway layout. The DAC20 also has provision for local switches and LEDs for manual operation & status indication. Its switch inputs can also be used for position feedback or as sensor inputs, using LocoNet to report status to the central command station. Controlling semaphore signals in response to point settings and track occupancy. (The unit can also generate the same signalling message as our SIGM20, to allow mixed semaphore and colour light signals). Controlling crossing gates, when track onto a crossing is occupied by a train. Preventing a "three way" point or single slip from being put into an "illegal" state. The DAC20 supports enhanced local routes. Local routes can be triggered by local inputs, by DCC accessory commands or by logic conditions. Local routes can trigger points on other accessory deciders, as well as those driven by the same DAC20. Using our PC program "Locoanalyse". settings can be edited on the PC and be saved to a file. They can download to the board through "live" LocoNet if you have a LocoBuffer or DigiTrax PR3 module. Using a "learn address" mode. By setting a single DCC accessory output, the unit can program the base address and set all outputs for Tortoise or Solenoid point motors. Using "on the main" ops mode programming. On a programming track, for diehard enthusiasts! The DAC20 has a full function LocoNet interface. It can generate LocoNet messages - for example sensor messages, point position reporting messages and signal control messages. It can respond to LocoNet messages: for example allowing outputs to be triggered by track occupancy sensor messages. The DAC20 can also report the position of points from the stored state WITHOUT needing feedback microswitches attached to tiebars: so PC programs such as Railroad & Co's "Traincontroller" will know the point positions after a "track power on" command. If you have the previous DAC10 model, these can be upgraded to the DAC20 firmware. Please see the DAC10 to DAC20 upgrade product for further details.